Designed exclusively for HEM continuous tool paths. 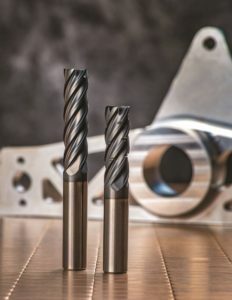 PERRYSBURG, Ohio, USA – May 23, 2018 – IMCO Carbide Tool adds the new AP5 Series of cutting tools to its POW•R•PATH line, revolutionizing the benefits of high-efficiency machining methods to work in aluminum alloys. A unique cutting edge design on all five flutes combines with generous chip evacuation space and an extra durable coating to generate incredibly high metal removal rates. AP5 Series tools are available with IMCO’s unique Chip Management System (CMS) to eliminate re-cutting and chip packing to allow deep, free cutting tool movement in aluminum. The results are great chip control and very high metal removal rates. Since 1977, IMCO Carbide Tool has made quality cutting tools that help manufacturers achieve new levels of profitability, customer satisfaction and a competitive advantage. By revolutionizing the way their tools are designed, produced, tested and used, IMCO strives to meet the ever-changing needs of a technologically diverse customer base. IMCO invests in ongoing research, new technologies and product innovations to provide customers the best possible product quality, performance and service. For more information, call 1-800-765-4626 or visit imcousa.com. Follow us on Facebook, and view product application videos on YouTube.